Traveling with your wheelchair or scooter made safe and easy! Our factory trained and certified installers ensure that your vehicle, personal mobility device and your vehicle lift all work in harmony to make your transportation experience as easy and efficient as possible. Designed for the large rear hatch openings that are prominent on minivans and some SUV’s, Interior Platform lifts are the simplest use and most convenient vehicle lifts on the market. These platform lifts install without any drilling or extensive modifications to your vehicle and can easily be removed or even transferred to another vehicle when necessary. Using an interior platform lift is as easy as pressing a button. 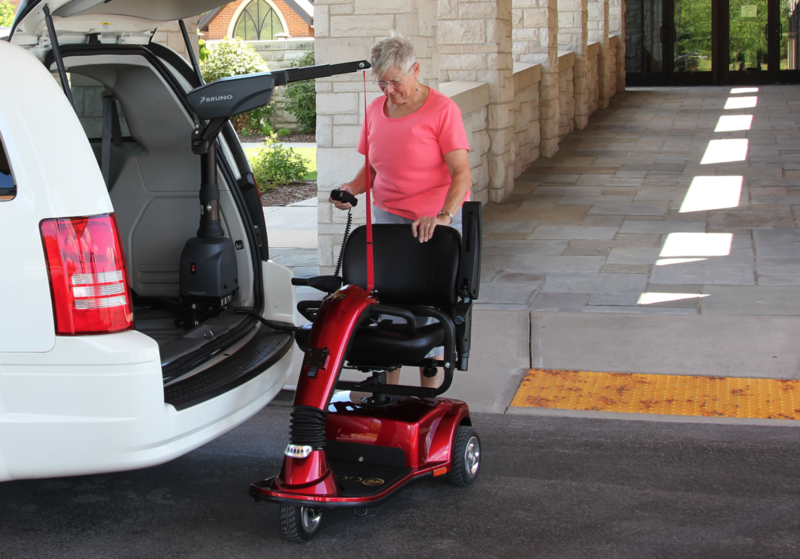 At True Mobility, we feature the Joey Lift from Bruno and the Backpacker Lift from Pride. These lifts have also recently evolved to work with some SUV’s and their generally tighter openings and higher floor to ground heights. 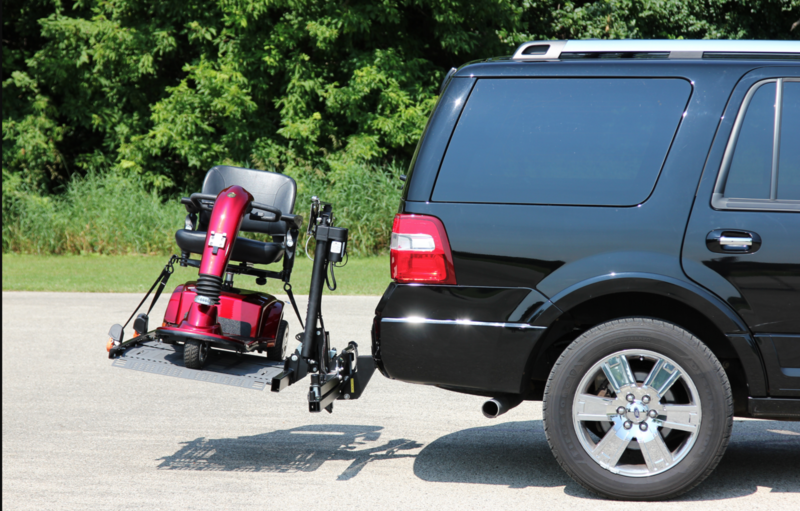 Designed for vehicles that can accept a class II or preferably a class III hitch, these platform lifts attach to the outside of your vehicle and carry your wheelchair or scooter behind you. These fully powered lifts are easy to use and convenient. They do not affect the cargo space on the interior of your vehicle. Exterior Platform Lifts can be transferred easily from one vehicle to another. Our featured brand is the Meridian Outside lifts from Bruno and the Outlander Exterior lifts from Pride. These lifts are fully integrated with your vehicle and must be professionally installed to insure your safety and the safety of others on the road behind you. A swing away option is available to allow you easy ingress and egress to the back of your vehicle when the lift is stowed in its upright position. Boom Style lifts are the most versatile vehicle lifts as far as applications are concerned. There are lifts that fit in hatchbacks and even in trunks! These lifts can be fully powered, manually operated and even easily disassembled in some cases. Boom lifts are designed for users with some dexterity because you must have the ability to guide your mobility device into your vehicle. Affordability is also a prominent feature on many Boom Style Lifts.